No one seemed to mind when a zoo employee was walking a lion cub at a park in the Russian city of Vladimir until the feline suddenly jumped and took hold of a nearby kid – and we don’t mean a baby goat. Police are looking into the incident. “The boy seems not to have received any injuries but he got really scared. 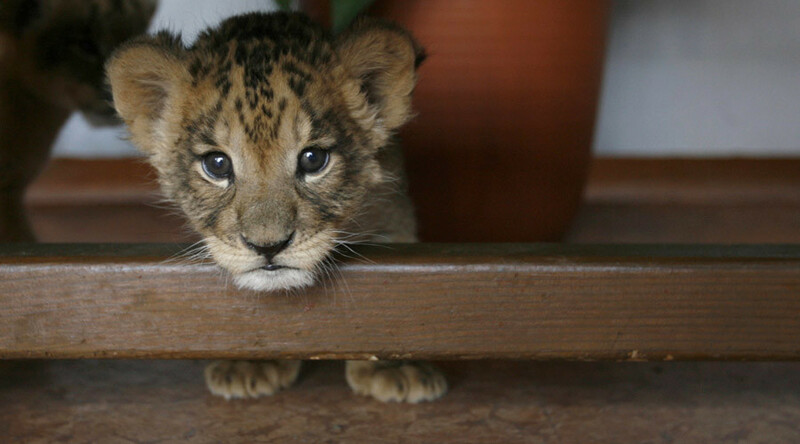 This zoo often comes here and I often see this lion cub in the park,” Aleksey Kulikov, an eye-witness, told LifeNews. The incident took place on Monday in the Russian city of Vladimir, which is located 200 kilometers (120 miles) east of Moscow. After the video emerged online, the Russian Investigative Committee announced it would look into the incident to establish whether there had been any neglect on the part of the zoo employee. The boy’s mother did not file a complaint, the Investigative Committee said, adding that there have been no reports of the boy being attended to at a hospital either. According to preliminary data from the Investigative Committee, “keeping the animal on a long leash, the woman took the feline for a walk out from the portable zoo area not taking into account the basic safety rules.” Having seen that there were children present at the playground, the owner continued to play with the animal, putting the lives and health of citizens in jeopardy, it said. However, the zoo workers seem to have a different view of the situation. “Actually, there was no aggression on the part of the lion cub,” said the zoo workers, as quoted by KP newspaper. “Faina [the lion cub] was just playing. The evidence to this is that the boy’s coat was just slightly damaged. The boy’s mom, after she calmed down, also said that nothing serious had happened and decided not to call the police,” they explained.